There are now on average 15 people coming to the art and craft group each Monday morning taking part in activities such as, oil and water colour painting, sketching, woodwork, knitting, making Christmas decorations, crocheting and any other art and craft activity that you might like to learn about. It is a good occasion when people get on well together enjoying chatting and catching up as well as doing art and craft. You will be pleased to hear that a similar group has started on a Wednesday afternoon 2 pm – 4 pm. All are welcome to come and have a go. We will be very pleased to see you there. To find out more please speak to Margaret. Over the past few years we have been collecting tins and packets of food once a month which are then taken to the Blackburn Foodbank. We have decided to make a change to the way we collect food. We are suggesting that you bring one tin/packet each week i.e 1 Sunday we will collect tinned tomatoes, the next Sunday we will collect tins of fruit etc. The following is the suggested list for October and November. These are only suggestions, if you are unable to bring something each week then we will be happy to accepted food as and when you are able. During this summer, Blackburn YMCA arranged many residential and day trips for the local refugee community, which enhanced their understanding of British Culture and helped them to integrate into the local society. Almost for the last two decades, Blackburn borough is one of the dispersal areas of newly arrived asylum seekers. When they get refugee status, some move to others towns and cities for jobs, education, and for many other reasons, but many stay here to start their new life and build-up community. Either someone is asylum seeker or refugee, the process of integration is always a challenge in a new culture and system. Because of economic dependency, psychological pressures, the language barriers, lack of cultural understanding, less opportunities for jobs, education and leisure activities, their low esteem, and limited interaction with the receiving communities, it is always a challenge for the refugee community to move forward and become fully part of the local community. Therefore, the YMCA arrange many activities, which help asylum seeker and refugee families and singles to move forward for integration and feel safe locally with less stress and anxiety. Africa, Asia, Europe, and Latin America were part of these trips. Picnic in Southport: The biggest day trip was a community picnic to Southport. On 12 August 2018, more than 115 people from Accrington, Blackburn and Darwen enjoyed the day at a church hall, fun land, in the town centre, and the seaside. 10 volunteers helped to organise the day. Everyone enjoyed the day, which began with a very warm welcome by Chris Goley, Brian and the other representatives of the congregation of Birkdale United Reformed Church. The church hall was set up with tables and chairs; people spent some time there to socialise, and enjoyed the wonderful refreshments, which were provided by the church. The way they welcomed our group was amazing, and everyone appreciated their openness and friendly attitude. We are so grateful to the church community for receiving our group in a very pleasant way. 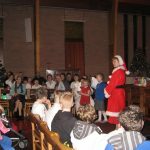 During the stay at the church hall, many young children came up on the stage to say hello and thanks to the rest of the group. Besides having a lot of fun and site seeing, people socialised, and talked to different people; it was a great time for integration. Moreover, they learnt British culture, values, and system of a completely different town from their home town Blackburn. Apart from spending time as a family, people met new people and made new friends, shared food with each other, and learnt to work as a team. After spending some time as a community at the church hall, the group went to the town and visited different places. Many people enjoyed lake cruises, swimming, music, and seaside while some learnt the geography of the area. Clapham Street Fair: Twenty-six (26) men, women, and children from 8 different nationalities spent an enjoyable day at the Clapham Street Fair on Saturday 28 July. There were many stalls of food, homemade jam and honey, handmade greeting cards, home-grown vegetables and plants, games, and other items. Blackburn YMCA organised the trip in collaboration with the Yorkshire Dales Millennium Trust. Clapham is a beautiful English village in North Yorkshire. This is a popular centre for natural beauty lovers, hikers, cavers, climbers, and potholers. The group visited the waterfall, the Village Hall, St. James Church, and the residence of novelist Alan Bennett. They saw an English village life and experienced an English village fair. Apart from vintage cars exhibition, they also witnessed traditional Morris dancing and enjoyed homemade cakes. Particularly, the children enjoyed the dove race, and some people shopped from the local charity stalls. Most importantly, the group met the UK and European young people from CWM (Council for World Mission). They spent more than an hour with them, and exchanged information and ideas. Judy Rogers, Sue Man, Kesha and Revd. John Davies made the day a day of friendship. Residential Trips: From 13 to 15 July, YMCA took three families from Nigeria, Pakistan and Syria to Ambleside where they had a wonderful time. The group, including 6 children, enjoyed a lot of indoor and outdoor activities. They also visited many places in the Lake District, including the graveyard of William Wordsworth, a famous English poet, and Chocolate Cottage. They had a wonderful experience spending 3 days in the Lake District. They benefited from the trip by understanding a little more about the UK, especially the beauty of Cumbria. Some of our single community members have also been to Broadrake for a 3 day residential trip in North Yorkshire from 30 July to 1 August. A group of young people from Netherlands and the UK (from CWM – Council for World Mission) also joined the group. The participants experienced the beauty of the area and enjoyed the landscape of North Yorkshire. They also learnt traditional construction method of dry stone walling and few other things. It was a unique experience of learning about history, geography, and culture from each other. Many of you reading this will have seen the Panorama programme ‘White Fright: Divided Britain aired on 22nd January 2018 which focussed on Blackburn to find a divided community. Their agenda was to visit Blackburn 10years on to show that it is still a divided Town. Well I have to say that nothing could be further from the truth. I’m now in my fourth year as Church Related Community Work Minister based with three churches in North and East Blackburn and that is not my experience, certainly not in the way the producers claimed it to be. It is fair to say that the majority of people in Blackburn were most disturbed by the way in which the programme was contrived, divisive and unrepresentative of all the hard work taking place in solving the issues of a community which is no more divided than any other major Town or City with a high ethnic population. In this reflection I wish to share some of the positive work which is taking place and the achievements which have been made. Two of the three churches I’m based with are situated in areas with high Asian populations and are working very closely with the local Mosques and other places of worship to forge closer links and breakdown misunderstandings and suspicions which inevitably do exist but this doesn’t constitute ‘divided communities’. Together we have held events which have seen people coming together to share food, explore each other’s cultures and discover ways in which we can work together. Revidge Fold URC were instrumental in developing a North Blackburn Inter Faith Trail which produced a resource to enable individuals, groups and schools to be able to visit all the worship centres in the area to discover each other’s culture and explore why we do what we do and the way we do it. At the launch of the trail a covenant was signed by all the church leaders and since then a faith leaders forum has been formed which has organised other events including a Faith Food and Friendship event which was attended by approx 60 adults and young people. Westbury Gardens URC have also been working with all the worship centres in East Blackburn and have been involved in a similar event and sharing in the breaking of the fast during Ramadan. All this work is supported by the very strong Blackburn with Darwen Interfaith Forum which is made up of all six of the world faiths. This group also arrange visits into local schools of all ages to share their faith and answer questions of pupils, sometimes very difficult questions as well as arrange school visits to worship centres. These visits are enjoyed by the children and young people and are very positive ways in helping to understand our differences in culture and practice. Derek Estill (General Assembly Moderator elect 2018-20) is a pivotal member of the Interfaith Forum and had this to say in a response to the BBC. “The Blackburn with Darwen Interfaith Forum is active and successful at running work programmes across the community to help break down barriers, build bridges and help people from all sections of our community cross over them. Through working together in partnership with others across the town, and wider afield, there is a growing awareness of the need to be a community that celebrates and embraces difference and helps those who feel anxious to form friendships and a sense of belonging. There is a lot of great work going on with refugees and asylum seekers and those who have been granted asylum both via churches and other agencies. One of our URC Churches, Central URC in Darwen on the outskirts of Blackburn hold a weekly drop-in DARE (Darwen Asylum & Refugee Enterprise) which assists those seeking asylum to learn English, find accommodation, fill in applications and give other assistance as required including support at hearings. John East is an Elder at Central and is heavily involved with this project and other work through Blackburn YMCA of which I’m a committee member had this to say as part of his response to the BBC. John is also a retired community Worker and local councillor. “Poor investigation and research – the producer and director need re training in factual reporting and certainly sends the wrong message of a community trying Its best to determine its destiny. As a local white resident born in the Blackburn area – I would have welcomed the opportunity to place the reality of what is going on. Instead a very contrived programme that fans the flames of racism and non British values. The YMCA is taking the lead on Blackburn with Darwen becoming a City/Town of Sanctuary which will be launched on 19th April and I am privileged to be involved in this project as part of my Ministry. None of this work was reported in the programme, why? because it’s Good News! This church has a strong presence in the diverse locality in which it is set. The Olympic torch came through the town on Saturday 23 June 2012 ending its Blackburn leg within close proximity of the church. We had a little stall dispensing cold drinks and Halal sweets to people round about. Gordon, a local artist, had painted a wooden banner to advertise our presence. The cavalcade of police and sponsors caused great cheers and flag waving and then the torch arrived. While we waited we were able to chat to people in the crowd, and there was a very good party atmosphere. Please note that the photo of the stall is not in front of the church but a derelict boarded-up pub on the main road where this leg of the torch ended! On Tuesday 5 June, the church was involved in a special Jubilee event. This was basically a street party for local residents held on church premises – a good job because of the weather! Church members organised lots of games, various stalls and craft tables on a jubilee theme but local residents contributed by bringing food and helping on the stalls. Gordon produced a wonderful painting of a corgi for us to try to pin on the tail. The church Fellowship group held its own celebration on Monday 11 June with a talk about the Queen by Susan Parkinson, one of its Elders, followed by a tea. Westbury Gardens URC was one of the founder members of Blackburn East Area Community Help (BEACH), which has played a significant part in empowering the local community. BEACH has made a number of successful bids which have brought funding and new facilities into the area. The church supported the “Wired Up Community”, a nationally funded project to supply computers to local households and provide training in their use. Significant amounts of regeneration money have been spent in the area to help improve the quality of life of the local residents. The area is recognised as a Community Regeneration Zone. Recently, churches in the east of Blackburn supported the Borough’s successful application for a Neighbourhood Management Pathfinder Project; this has brought additional funding to the area. 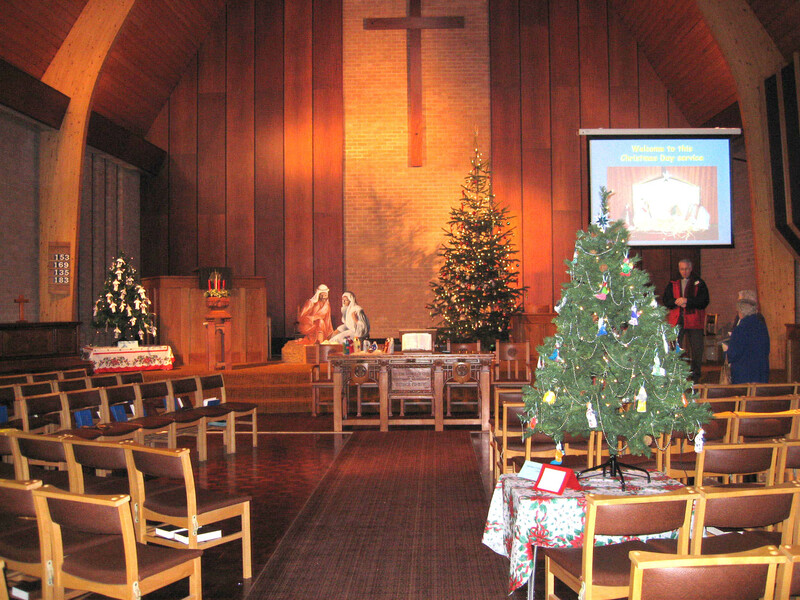 The church has benefited from external funding to improve its security and car park area. This was obtained through a community bid in co-operation with BEACH Partnership and the Groundwork Trust. The Church hosts visiting groups as part of the Borough’s Community Cohesion and Cultural Diversity tours. The church organizes a Carnival in August each year for members of the neighbourhood. These have been very well attended and have helped us to get to know our neighbours better. BEACH Judo Club meets regularly in the Church Hall and members have participated regularly at the Annual Church Carnival. 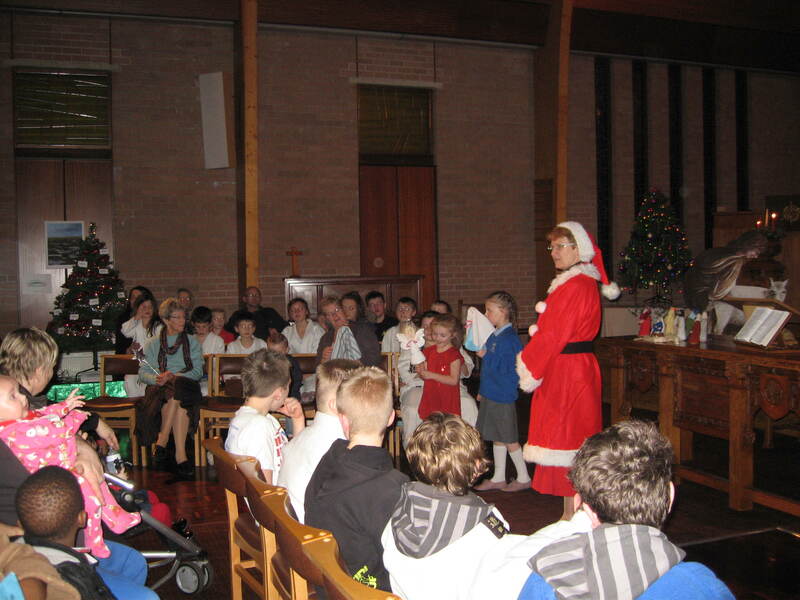 A short Christmas T ree service is held each year and children and young people from the Judo club attend. 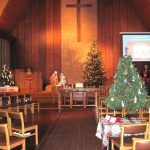 Groups who use the church are invited to decorate a tree and attend this and other Christmas services. This photo shows our Minister at the 2011 Christmas Tree service. BEACH sponsors a weekly Arts and Crafts group on Tuesday afternoons from 2 – 4 pm.